Definition at line 45 of file llpacketring.h. Definition at line 44 of file llpacketring.cpp. Definition at line 60 of file llpacketring.cpp. Definition at line 86 of file llpacketring.cpp. Definition at line 66 of file llpacketring.cpp. Definition at line 66 of file llpacketring.h. Definition at line 67 of file llpacketring.h. Definition at line 92 of file llpacketring.h. Referenced by LLMessageSystem::checkMessages(), and LLMessageSystem::dumpPacketToLog(). Definition at line 117 of file llpacketring.cpp. References LLThrottle::checkOverflow(), f, LLPacketBuffer::getData(), LLPacketBuffer::getHost(), LLPacketBuffer::getSize(), mInBufferLength, mInThrottle, mLastSender, mReceiveQueue, NULL, S32, and LLThrottle::throttleOverflow(). Definition at line 153 of file llpacketring.cpp. References f, FALSE, get_sender(), LLPacketBuffer::getSize(), ll_frand(), llendl, llwarns, mActualBitsIn, mDropPercentage, mInBufferLength, mLastSender, mMaxBufferLength, mPacketsToDrop, mReceiveQueue, mUseInThrottle, NULL, receive_packet(), receiveFromRing(), and S32. Definition at line 244 of file llpacketring.cpp. References LLThrottle::checkOverflow(), f, LLHost::getAddress(), LLPacketBuffer::getData(), LLTimer::getElapsedTimeF32(), LLPacketBuffer::getHost(), LLHost::getPort(), LLPacketBuffer::getSize(), llendl, llinfos, llwarns, mActualBitsOut, mMaxBufferLength, mOutBufferLength, mOutThrottle, mSendQueue, mUseOutThrottle, NULL, LLTimer::reset(), S32, send_packet(), LLThrottle::throttleOverflow(), and TRUE. Referenced by LLCircuitData::resendUnackedPackets(), and LLMessageSystem::sendMessage(). Definition at line 92 of file llpacketring.cpp. Definition at line 107 of file llpacketring.cpp. Definition at line 112 of file llpacketring.cpp. Definition at line 97 of file llpacketring.cpp. Definition at line 102 of file llpacketring.cpp. Definition at line 76 of file llpacketring.h. Referenced by getAndResetActualInBits(), and receivePacket(). Definition at line 77 of file llpacketring.h. Referenced by getAndResetActualOutBits(), and sendPacket(). Definition at line 82 of file llpacketring.h. Referenced by receivePacket(), and setDropPercentage(). Definition at line 79 of file llpacketring.h. Referenced by receiveFromRing(), and receivePacket(). Definition at line 73 of file llpacketring.h. Referenced by receiveFromRing(), and setInBandwidth(). Definition at line 88 of file llpacketring.h. 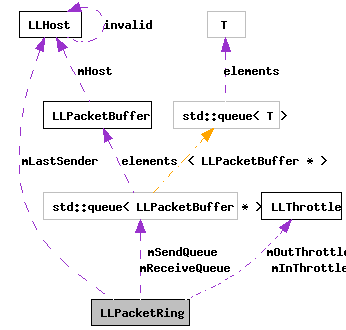 Referenced by getLastSender(), receiveFromRing(), and receivePacket(). Definition at line 78 of file llpacketring.h. Referenced by receivePacket(), and sendPacket(). Definition at line 80 of file llpacketring.h. Definition at line 74 of file llpacketring.h. Referenced by sendPacket(), and setOutBandwidth(). Definition at line 83 of file llpacketring.h. Referenced by dropPackets(), and receivePacket(). Definition at line 85 of file llpacketring.h. Referenced by free(), receiveFromRing(), and receivePacket(). Definition at line 86 of file llpacketring.h. Referenced by free(), and sendPacket(). Definition at line 69 of file llpacketring.h. Referenced by receivePacket(), and setUseInThrottle(). Definition at line 70 of file llpacketring.h. Referenced by sendPacket(), and setUseOutThrottle().